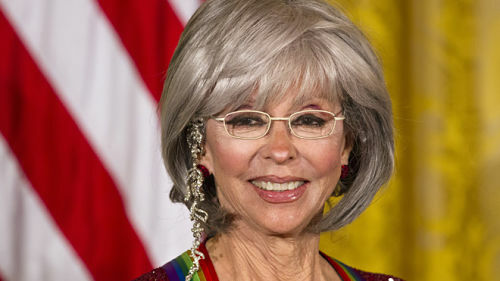 It was an honor long overdue for Rita Moreno. The Puerto Rican trailblazing actress received the coveted Kennedy Center Honors – the nation’s highest award for lifetime achievement in the arts. "She's still a leading lady of her era, a trailblazer with courage to break through barriers and forge new paths," President Barack Obama said at an early White House ceremony on Sunday. At a gala later that night, Moreno was honored for her diverse and boundary-pushing career that included becoming the first Latina to win an Academy Award for her performance as Anita in “West Side Story” and releasing her first Spanish-language album “Una Vez Mas” at the ripe age of 83. She is one of a handful of artists to win an Oscar, Emmy, Grammy and Tony. She joins Placido Domingo, Chita Rivera, Carlos Santana and Martina Arroyo as the only Kennedy Center honorees of Latino origin. Tributes to Moreno on Sunday came from her "Jane the Virgin" co-star, Gina Rodriguez, and Rosie Perez, who sang "Fever" with the overzealous Animal of "The Muppets" on drums — a performance Moreno originated, winning an Emmy. They said Moreno paved the way for themselves and other Latino actors. "She was herself," Perez said. "She celebrated her heritage but did not stereotype it." Moreno’s fellow honorees included actress Cicely Tyson, conductor Seiji Ozawa, singer-songwriter Carole King, and filmmaker George Lucas. As the tribute to Lucas began, the crowd was asked to welcome Carrie Fisher. But the star of the original "Star Wars" trilogy and the upcoming "Star Wars: The Force Awakens" didn't appear in person. Instead, one of Lucas' beloved creations, the feisty droid R2-D2, rolled onstage and projected her image. "I wanted to be there to help celebrate your Kennedy Center honor in person, but hey, since you invented video voicemail, I don't have to be," Fisher said. Steven Spielberg and Martin Scorsese, fellow directors who along with Lucas brought new energy to American cinema in the 1970s, offered more conventional tributes to the "Star Wars" creator, hailing him for his technological wizardry and his commitment to storytelling. Lucas also created the "Indiana Jones" franchise, directed by Spielberg, and his special-effects company, Industrial Light & Magic, had a part in seven of the top 10 grossing movies of all time. "He's a pathfinder and a pioneer like Edison and Bell and Tesla and Jobs," Spielberg said. "George Lucas' 'Star Wars' absolutely changed films forever." "The Force Awakens," the seventh movie in the franchise and the first made without Lucas' involvement as director, producer or writer, opens Dec. 18 and is expected to be one of the highest-grossing films in history. Tyson, a longtime star of stage and screen, has said the honor validated her decision to turn down many roles as she tried to find meaningful work as a black woman. Her memorable performances include "The Autobiography of Miss Jane Pittman," which won her an Emmy, and the groundbreaking miniseries "Roots." She won a lead-actress Tony just two years ago and now, at age 90, she's starring on Broadway alongside James Earl Jones in "The Gin Game." "She turned down more roles than you could imagine because they didn't lift or serve us as a people," actor-director Tyler Perry said. "For six decades, she has been diligent in her pursuit to better us all." Ozawa, who was born in China to Japanese parents, began conducting as a teenager in Japan after World War II. He went on to lead the Boston Symphony Orchestra for 29 years. Violinist Itzhak Perlman and soprano Renee Fleming paid tribute to him during Sunday's honors, which also included a performance by past honoree Yo-Yo Ma. King was inducted into the Songwriters' Hall of Fame nearly 30 years ago for her broad influence on pop music, which helped shape the sounds of the 1960s and 70s. She has written more than 100 hit singles, including "The Loco-Motion," ''One Fine Day" and "I'm into Something Good." Her first solo album, "Tapestry," is one if the highest-selling albums of all time. Aretha Franklin, wearing a full-length fur coat over her evening gown, closed the show with a performance of a song that she immortalized: "Natural Woman," leading to a prolonged standing ovation. President Barack Obama was a late arrival to the event after delivering a rare televised address in which he said America would overcome the threat posed by Islamic State militants. Stephen Colbert of CBS' "The Late Show" hosted the 38th annual Kennedy Center Honors gala for the second consecutive year. It will be broadcast Dec. 29 on CBS. The five Latino performers honored by the Kennedy Center since 1978 There are only five Kennedy Center honorees – Placido Domingo, Chita Rivera, Carlos Santana, Martina Arroyo and Rita Moreno – have been of Latino origin. Based on reporting by the Associated Press.